Eat Filipino food in Greenwich on Saturday 29th March at one of Plum Tree Cafe's regular pop-up nights. 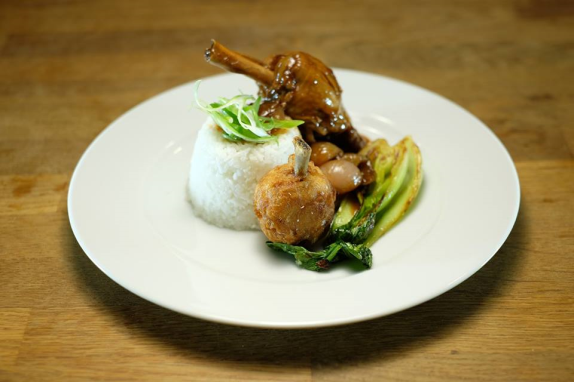 £20 gets you a 3 course set meal from LeHappyChef, featuring fine contemporary Filipino cuisine. "Few people have ever tried Filipino food and there are even fewer places that serve it! Now you have a chance to indulge on dishes such as 'Chicken Adobo' (considered the national dish of The Philippines), a braise of chicken cooked in an array of delicious spices, served with rice. They say Filipino food is the 'original fusion' cuisine and this is just one of the dishes that hails from the Philippines. The country made up of over 7000 beautiful islands! As with many culinary traditions, food in a Filipino household is what brings all friends and family together. We want to share the same hospitality style of my Filipino heritage. Our grub clubs will be known for a comfortable and great social experience complemented by LeHappyChef's delicious contemporary Filipino cuisine. LeHappyChef and his team will deliver you the best hospitality and food they possibly can. We pride ourselves on being consistent to a high standard and our goal is to always make sure that you have an enjoyable experience when dining with us. We want you to enjoy your stay and feel relaxed."